St. Colmcille is said to have founded the Holy Well on the Well Road in Swords. Legent has it that he took a ''Giant Step'' from the Round Tower and landed at the spot to where the Well is. This of course is Folklore and nobody beleives the tale. But that's what the children of Swords were told growing up in the 50's and 60's. 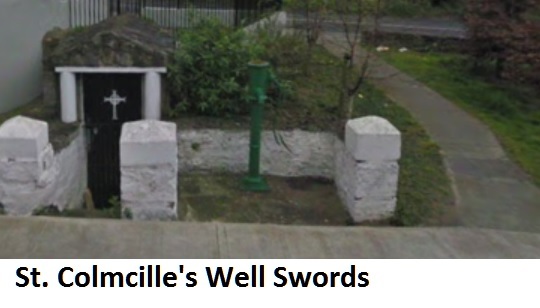 The Well may have been founded by St. Colmcille but that's about it. It had many uses for the people of Swords before the steel door was closed and a gate leading to the steps were placed there many years ago. For example as it was regarded as a ''Holy Well'' it was said that the water was holy so people took small amounts home to bless their houses. Another use was when the water pumps ran dry during the summer months the local people went to the well with their buckets and brought the water home for cooking and washing. As with most wells the water was christal clear and ice cold to drink. The pump on the right in the photo. is standing right above where the well is below.